And once these eight rows are done, we'll work a few extra rows for the two adult sizes. If you're knitting either of the smaller sizes, skip straight to the next instruction. Bind off loosely, and then repeat with the provisional stitches from the back of the hat. Stitch both purled edges in place where they naturally curl under. Tuck in ends and make and attach pompom, if desired. Block earflaps, if nothing else. Oh, and I highly recommend that you knit at least two matching hats, for optimal family adorability, or at least make one for your dog. hat looks so cute, got to make it for a greatgranddaughter in pink with flower, thanks for the pattern. Dear Gretchen I have never used one of your patterns before but I really liked this one and I do appreciate so much your letting me print it for free. I belong to a senior center group that knits for charity. I've wanted a ear flap hat for a long time. So thanks a lot! I've never used circular needles before. Can I use straight needles instead. I work with Dr A in Dallas. He told me about your blog! Love it. Do you knit for others and sell? Hi Alexandra! I'm glad you like my blog (and, of course, that my father-in-law recommended it) :) And mostly I just knit for others and give stuff away - I have piles of knit goods laying around the house. The kids and the husband wear tons of it too! Actually my name is Kim, Alexandra is my daughter and the title of my blog. I was wondering if I could pay you to make 2 of the Kids' Bowknot Cowls in Ivory for my 5 and 7 year old girls. Is this your daughter modeling? She looks almost exactly like my grandaughter! I'm a beginner knitter. I can follow a pattern but some of the terms and techniques are new to me. What is a provisional cast on? And as far as the provisional cast on is concerned, it's a bit of an intermediate technique, but certainly manageable with practice! :) You can find more info here: http://www.knitty.com/ISSUEfall05/FEATfall05TT.html. If you search youtube, you can also find some videos with alternative techniques, although I haven't found one that I love. Hopefully some day I'll put one together, when I have time! Oh wow! Now that's an idea :) I'm sure it would be possible, and I would be happy to scale up a version of the pattern if you wanted to try it. However, I definitely couldn't guarantee perfection without trying first myself, as felting can be tricky. The hat would also lose any stretch if it were felted, of course, so it might end up fitting a bit more like a helmet. Cool! 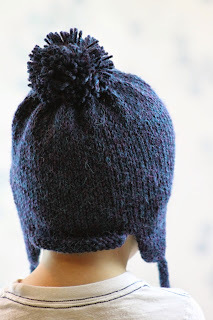 Find your yarn, knit a swatch, felt it, and give me before and after measurements and I'll make you a hat pattern to try out! :) And it doesn't matter if your gauge doesn't match this hat gauge, either! swatch done. Started with 20 rows, 20 stitches; 7.5" x 6.5". correction: the width did not change; only the length. Great! Last question: what size hat do you want to make? And I'm going to be out and about for a bit, but I'll get to this as soon as I can. So let's get started! Using your largest needle (I don’t know what needle you knit this on, but you’re going to need a bigger one for this cast on, or two needles held together) and a provisional cast on, cast on 64 stitches. Then, transfer stitches to your gauge-producing circular needle, place marker, and join in round. Knit until piece measures about 11", and then we'll begin the decreases, as follows. Remember to switch to your dpns once you're down to about 44 stitches. 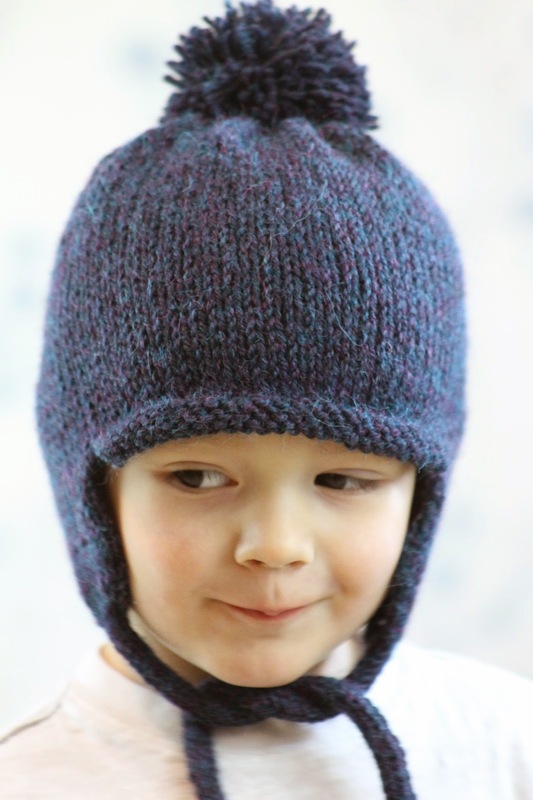 Do you think it would be poss to add earflaps to a hat already knitted? May I know wat is ssk and k11 means knit 11 stitches? And yes, k11 means knit 11 stitches. I'm doing it on 24 pegs round loom. U have any instruction guides on that? Many thanks. You are so sweet and helpful. Have a blessed day. As I am in New Zealand our wools are different. Can I adjust this pattern to suit Double Knit wool (8ply) and can it be knitted in 4ply. I love the look of the pattern but the wool gauge is not right for me. My gauge worked out to be size 10 needles. Does this mean I use 11 or 13 needles for the provisional cast on? I think you can probably just use one of the sizes more or less as-is for that, but I'd like to know your exact gauge to be sure! Can you tell me how many stitches you're getting per four inches? I get 22 stitches to 4 inches on US 6 needles. Thank you so much for your prompt reply. When doing the whipstitch, do you use yarn or thread? Sorry for the duplicate post. I didn't think the first one went through. Also sorry for so many questions. I'm a relatively new knitter. No worries! I'm always happy to answer questions. :) And I used yarn for the whipstitch, and basically just made a technique up that worked for me. As you've probably noticed, most patterns give you a lot of leeway when it comes to finishing instructions, so you can kind of just do what works for you. Thank you so much! You've been very helpful! Hi Gretchen. I'm about to start this pattern and can't wait for my 5 year old to wear it. I've read your pattern twice and can't figure out where the breaks in the provisional casting are located. Do you mind sending explaining please? Thank you! Ah, after reading your pattern for a 3rd time, I think I understand. Is the break in the provisional casting the place marker? And when you write to transfer 9 stitches on either side, do you mean 18 stitches total? Thanks again! This pattern is perfect! 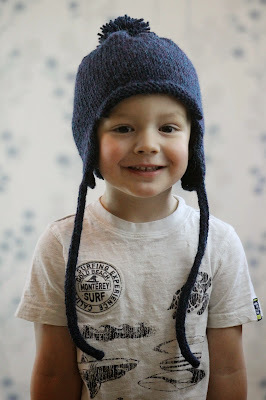 I knitted two hats for my 2 (toddler) and 5 (child) year old. Thanks again! The amount of stiches is the same for child and small adult, is this correct? Hey there! I noticed most of the hat is KNIT... However from your cute photos it looks like the entire hat is knit and purl? Is this correct? Thanks! It's templa here again!! So wierd...surfing the net for a great ear flap hat for my husband and what do you know....it's yours! Again! Lol....can't thank u enough for your great stuff! All the girls loved their iris bloom bonnets for xmas....and this will b my first hat finishing with dpns...not scared..just try to avoid lol....so thanks again for all your amazing patterns....I just need to always check here first! What a lovely compliment, thank you! :) I'm glad you're enjoying my patterns. And you could always try the Magic Loop on the decrease if you're more familiar with that technique. Either way, I know you can do it!!! And please, let me know if you have any questions. This is turning into a book...but I think my light just turned on! Tell me if I'm getting this right....as I'm working my ear flaps and finishing the edging I will b removing my scrap yarn as I go??! Oh please say ....you got it!! Jeez....I thought I was loosing my knitting skills! Lol....thank u so very much for keeping up on answering my questions. ..I don't know how u do it but yay! I think I got it too.....finally..you're a gem! This is such a cute hat! Thank you for your pattern! I have a question about the front and back curled purl edge. I'm new to knitting and struggle a bit with reading patterns. 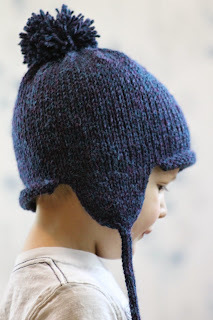 I read it as, from the front side of the hat, purl the first row, then knit, purl, knit and bind off with a purl stitch? My edge curled down instead of up like I think it looks in the pictures. Did I do it backwards? Thank you! Oh perfect! Thank you, I really appreciate your prompt response! Love this pattern and will be knitting it again! Great! Let me know if you have any other questions!!! Hello!! I am a new knitter, having only made a baby blanket for my son 6 months ago. But I love this hat and found it while searching for an ear flap to make for family pics! 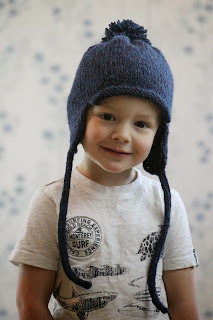 I'll be making this hat for a 6 month old boy, 12 month girl, and 4 yo girl. So I'm planning to follow the pattern as written for the 4 year old but how to make it small enough for the babies? I'm also thinking of making the hats in heather gray and making different color Pom poms at the top. What do think? I think your color choices sound adorable! :) And I totally think that this hat will work for what you're planning, and is feasible for most skill levels, although it does use a few slightly more advanced techniques (notably the provisional cast-on). As far as sizing goes, the toddler size should be a good fit on your 12 month old as long as your gauge is accurate, and the child size will be perfect for your 4 year old. Give me a couple of days and I'll post a version for your little one as well! Bind off loosely, and then repeat with the provisional stitches from the back of the hat. Stitch both purled edges in place where they naturally curl under. Tuck in ends and make and attach pompom, if desired. Block earflaps, if nothing else. 2. Slip knit wise, slip purl wise, put left needle into the front of the 2 slipped stitches on the right needle and knit. 3. Slip knit wise, slip knit wise, left needles into the front of 2 slipped stitches on the right needle and knit. 😃 Thanks again for your help! Hi there! I love this toque and am most of the way through, but am stuck on the ear flaps. Could you please help me understand how to "transfer 9 stitches from either side of the break in your provisional cast on (which also aligns with the hat's back seam) to a scrap of yarn to hold for later (all sizes)"? Thank you for the free pattern and it's awesome that you've been replying to so many people over the years. All I'm trying to say is that your row marker should mark the back seam of the hat, and that you'd like your ear flaps to end up evenly spaced on either side of the back seam. So when you transfer nine stitches from either side of the row marker to a scrap of yarn to work later, the next stitches on either side will be your earflap stitches. Does that help at all? It does! Thanks, Gretchen. I'm still unsure what you mean by transferring stitches to a scrap of yarn to work later. Sorry! I haven't followed a lot of patterns. I loved knitting this hat in Oceanix colour for my grandson, it's the first time I've ever attempted provisional cast on and used some you tube videos to learn how to do it. I'm almost finished but unsure of what blocking is, could you explain it to me please? I'm so glad you enjoyed the pattern, and learned something new. :) As far as blocking goes - you know when you buy a sweater and it tells you to wash it and then shape it and lay it flat to dry? That's essentially what blocking is - getting your knitting wet (how you do this depends on the fiber; sometimes you simply spritz it with water, other times you dunk), and then laying it out, often pinning it in shape, to a towel or on blocking mats. The purpose of this is to "set the stitch," or, especially with things like lacy shawls, spread and set your lace so that it looks flat and pretty rather than shriveled up and messy. 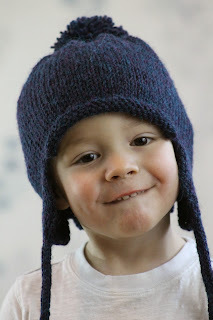 I am soooo happy to find this hat pattern! Earflap hats are the ONLY kind my Grand Niece & Nephew will wear! They cannot be convinced to wear any of their other sorts of hats, so since I'm in a hat knitting mood lately, it makes no sense to knit them any other kind. So I'll be using your lovely pattern for several hats -- including four adult, so their parents, GrandMa (my sister) & I all have similar ones!! All done in slightly different variegated colors. Acryllic, so they wash/dry quickly and easily. Given that I'm looking to make at least six hats, is there any possibility it's available as a downloadable, printable and/or pdf format somewhere, somehow?? I find is so very much easier to follow a pattern offline, printed or offline up and down on whichever screen is closest. And for those waiting rooms with lousy internet connections, lol, where I do a LOT of my knitting!! Very well done, very nice, very practical and FUN pattern!!! I'm in the uk, can I use 5mm circular needles 4ply DK yarn and small adult pattern to knit this gorgeous hat for my 5yearold granddaughter or does it not work like that..? Smaller needles thinner yarn bigger pattern? Hi! Yes, that usually works as long as you continue to follow the length directions for the size you're making. :) If you give me your exact gauge I can also make a more precise recommendation! This pattern looks great. I am wondering if I were to line the inside with flannel, what adjustments in size would you suggest for a large adult? Thank you! How is this pattern adapted to knit for other family members? I wish to knit for ages 4, 7, mom and dad. Thanks! I just made this hat for a two year old and it turned out so cute! Thanks for sharing. Thank you so much for this pattern! I'm so excited to make it! I just finished two; the first a toddler size for my 4yo nephew, and then I made one a bit smaller for my 6mo nephew. I hadn't read the comments before attempting to adjust the pattern, so I went ahead and used smaller needles and a thinner yarn. I kept the 70 st C.O. but started the decrease at 5" instead of 5.5". I also kept the ear flaps the same size but to bring it down to 3 sts for the icord, I did a CDD then began the icord. My question is about the icord length and if it's recommended for babies, or should I make a chin strap for a button instead? I want it to be functional and not pose any danger of choking. Thanks! Thank you so much for this pattern. I was at the discount store today and saw these hats for sale. I didn't realize that they were still popular. Now I have to make several.